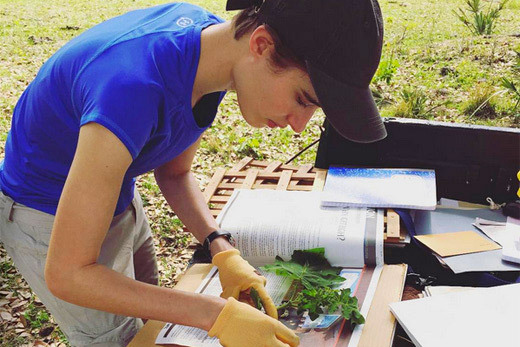 On a recent trip to South Florida, Emory students collected plant samples to bring back to the Emory Herbarium. The Emory Herbarium, founded in 1949 by members of the biology department, was closed for decades, and its collection of more than 20,000 specimens was kept in storage. The facility, which recently reopened in the Rollins Research Center, needs $10,000 to help restore and annotate some of its damaged specimens, including rare plants in the Granite Rock Outcrop Collection, which grow in the vernal pools of Arabia Mountain and Stone Mountain. The funds will also support digitizing the specimens so they can be posted online and accessed from around the globe. Check out the Herbarium’s Momentum fundraising campaign to learn how to contribute. Mackie is one of six Emory students who spent a recent alternative spring break in the field in rural South Florida. The students looked for plants used in indigenous medicine in the past, and collected specimens for the Emory Herbarium, under the guidance of medical ethnobotanist Cassandra Quave. They learned to identify endemic plant species in the wild, how to dig deep roots out of the thick mud of a marsh – even how to harvest and cook a swamp cabbage and make a mean guacamole. "The best part was learning about plants from local people who knew how they were traditionally used," Mackie says. Florida rancher Bob Brewer spent several days with the students in the field, introducing them to the gopher tortoise, a keystone species, and pointing out plants such as a thorny vine of smilax, which the locals call pipe briar. We kept pulling and pulling on the stem," Mackie says, "and finally we got to this big tuber. He told us that old-timers used to hollow out these tubers to make pipes for smoking tobacco."